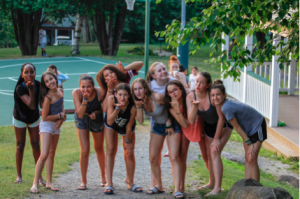 It may seem like simply a lot of fun but what you come away with from a summer at Brant Lake Dance Camp is immeasurably beneficial to your growth and your life. You’ll learn new skills; like making great friends and how to roast the perfect marshmallow after finding your own perfect marshmallow stick. You’ll learn to overcome adversity; like how to deal with and take care of a little bug bite, or that the marshmallow that you burnt really still tastes good. You’ll gain courage; because you will try things that you would never try at home, like Yoga or Tap (or toasted marshmallows). You just plain have a great time. No pretense, no expectations on you from anyone other than yourself. You dance and play all day with your friends and at night everyone goes home together and when you wake up you do it all again! You make memories that will last a lifetime, when you see your first shooting star while lying on the ground at the shore of beautiful pristine Brant Lake.